A new biography by Roger Lipsey invites today’s readers to explore Hammarskjöld’s politics, his spirituality, and the life that led from Sweden to global responsibility. Dag Hammarskjöld, second Secretary-General of the United Nations, left a legacy of acute political wisdom. Ranging from tactical insights to the psychology of leadership and peacemaking to the hopes of humanity, Hammarskjöld’s thought deserves a renewed welcome in today’s world. And then there is Markings, his private journal, classic in the literature of spirituality. We’ll keep it in mind here. 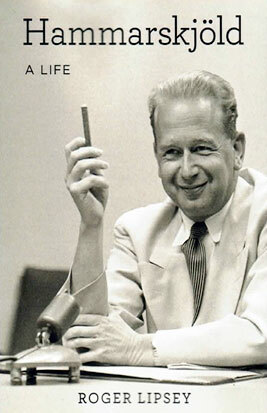 An open-ended series on Hammarskjöld’s political wisdom, now with more than 50 short ‘chapters’. Some thoughts and words are altogether haunting—even some years later. On this day the UN released the latest findings on the causes of the air crash that took the lives of Dag Hammarskjöld and 15 others. A major advance, the report can be read here. The United Nations Association–Westminster Branch UK makes a remarkable effort to follow news of Dag Hammarskjöld, and sometimes makes news. A reliable resource for us all. "The Practice of Peace: A Lecture on Dag Hammarskjöld" was delivered by Roger Lipsey, with a thoughtful introduction by the Swedish ambassador to Norway, Mr. Axel Wernhoff, and post-lecture dialogue with Norwegian Prof. Bernt Hagtvedt and members of the audience. The audio version of the event includes the introduction and dialogue.